What is the purpose of a place of worship? Going back to the roots of religious gathering spaces was important for us know how to look ahead. Through our search we established three universal principles to guide our design; One, create a place to serve and strengthen people’s relationship with their god; Two, allow a space for personal reflection; and Three, give people a safe place to gather, communicate and share their thoughts. Simply; connect to your god, connect to yourself, and connect to each other. 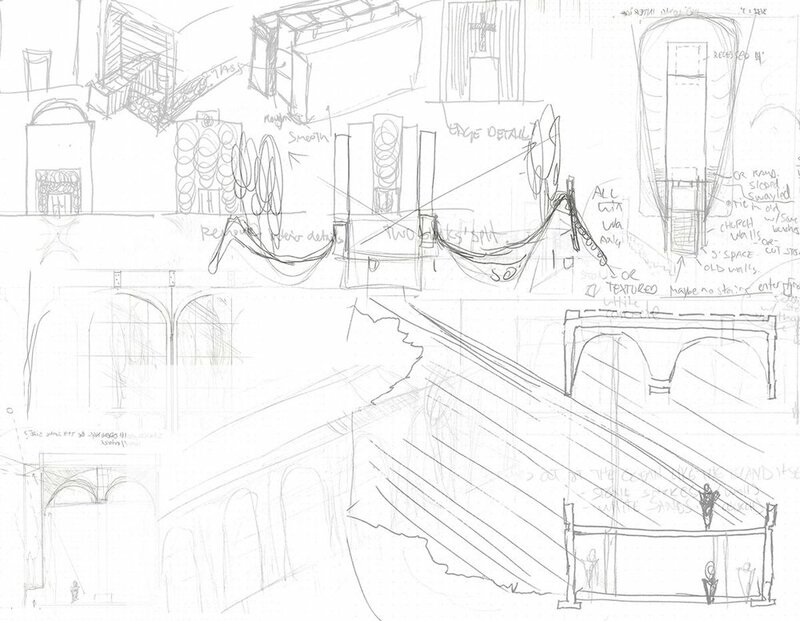 From these fundamental principles we derived our design to accomplish these connections. A row of Large windows going down both sides of the building will flood the space with light creating an uplifting atmosphere and a connection to the outside. As sun light filters through the leaves of the trees surrounding the church, dramatic shadows are cast onto the interior bringing life into the space. We prioritized bringing nature into the religious discussion. “Nature front and center” for us meant connecting people not only to the creator but also the beautiful creations, the things around us everyday that can remind us of our faith. The garden just beyond the alter is in full view through an operable glass wall that allows access to the garden and fresh air to flow through the space as desired. 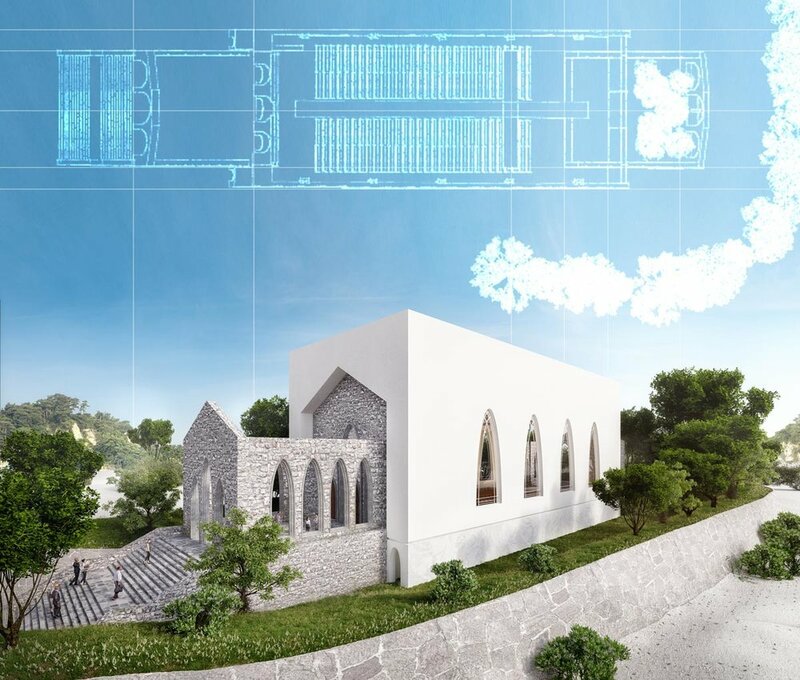 The church is surrounded by a richly planted earth berm inspired by the islands natural landscape - white sands emerging from the oceans that turn to the stones that trace the green landscape. The raised earth serves to create a private garden surrounding the entire building and can be a space for personal reflection. The elevation of the land also allows the gardens to be visible from inside the church, helping to create the feeling of protection. The open air structure in the front creates a safe space for people to socialize and children to play before entering church yet is still part of the church experience. 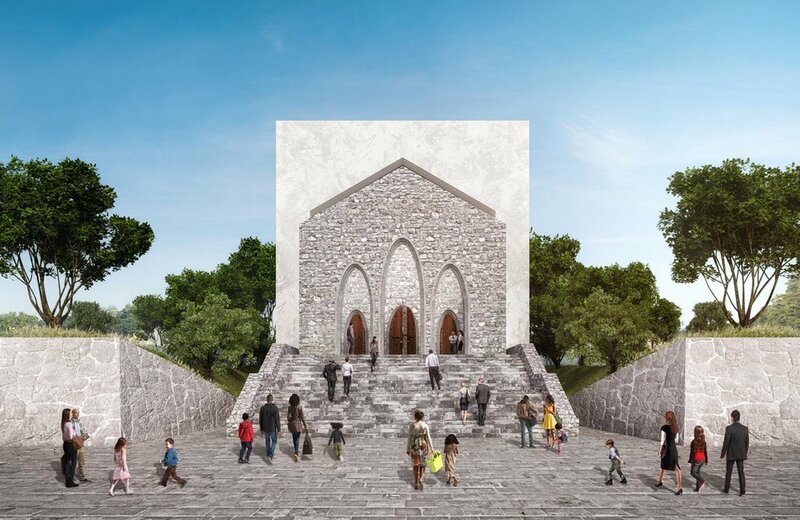 In keeping with traditional island whitewash finish, the main body of the church has a smooth concrete exterior with a textured front and rear, so to appear as if it were cut from a single block of granite. In contrast, the rough stone structures at each end of the building give the impression of being extruded from the inside of the clean white stone. The interior of the space has smooth white walls replicating the exterior aesthetic, while in contrast, the ceiling is an ornamental structure with a cross running the full length of the building that is lit from the top to give a glowing effect in the evening. Using non-fixed seating the space is able to accommodate large services as well as smaller more intimate events. The lower level houses classrooms, necessary kitchen space, bathrooms, and storage. The flat roof can accommodate a solar array allowing the building to run free of fossil fuels.